“Bunny” Hamburger Box perfect for Easter!!! Have you seen this Hamburger Box Bigz XL die in the Stampin’up catalogue? It’s such a fun way to make your own box!!! I made this design for Easter and I think you will like it as much as I do!!! I wanted to add some dimension to my bunny face, so I used white cotton balls, a pink pompom and big googly eyes (from your local craft store or Dollar store). I cut 2 ears out of Whisper White card stock and color the center with a Pink Pirouette marker. The whiskers are made with 2 tiny strips of Basic Black card stock, attached in the center under my pink pompom. Whisper White and Basic Black cardstock, Pink Pirouette Marker, 1 pink pompom, 2 cotton balls, 2 googly eyes. Big Shot and Hamburger Box Bigz XL die. 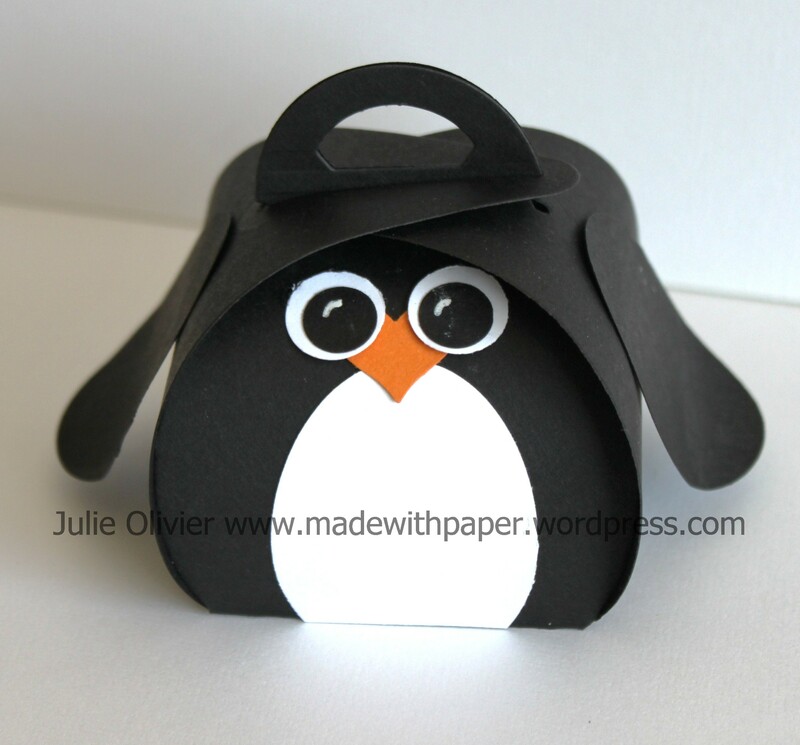 Today’s project is a really cute Penguin box made with the Curvy Box Thinlits dies. In the Fall, I made a few different boxes with this template (pumpkin, Scarecrow, etc…) You can see those boxes here.) Now, as a “Winter” theme I went ahead and made this one! To make this cute penguin, I used the Extra Large Oval punch for the white belly and for the wings, the Heart punch from the Itty Bitty Accent punch pack for the beak and the 1/2″ Circle punch and 3/8″ Circle punch for the eyes. I used the White Signo gel pen to add the little line in the eye. 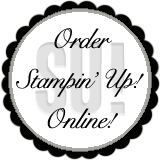 Tools: Big Shot and Curvy Keepsake Thinlits dies, Extra-Large Oval punch, Heart punch from the Itty Bitty Accent punch pack and the 1/2″ Circle punch and 3/8″ Circle punch. I have a great Father’s Day card for you today! It’s simple enough that even children could do it! Here’s the tip for the shirt. If you fold the upper left corner to create the shirt collar, the pattern on the back of the designer paper is not the same. So here’s how I did it: I cut the lower right corner and glued it at the back of the collar. Then fold to make the collar and add 3 small buttons. (Glue dots work best!) Adhere on your card base. For the suit, cut a piece 3-5/8″ x 5-1/2″ of Island Indigo card stock. 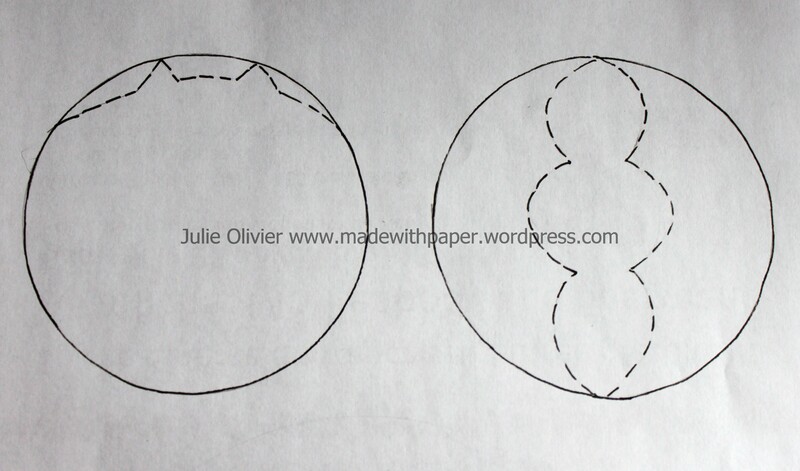 Fold the upper left corner to make the suit collar. Add another little triangle to finish the collar. 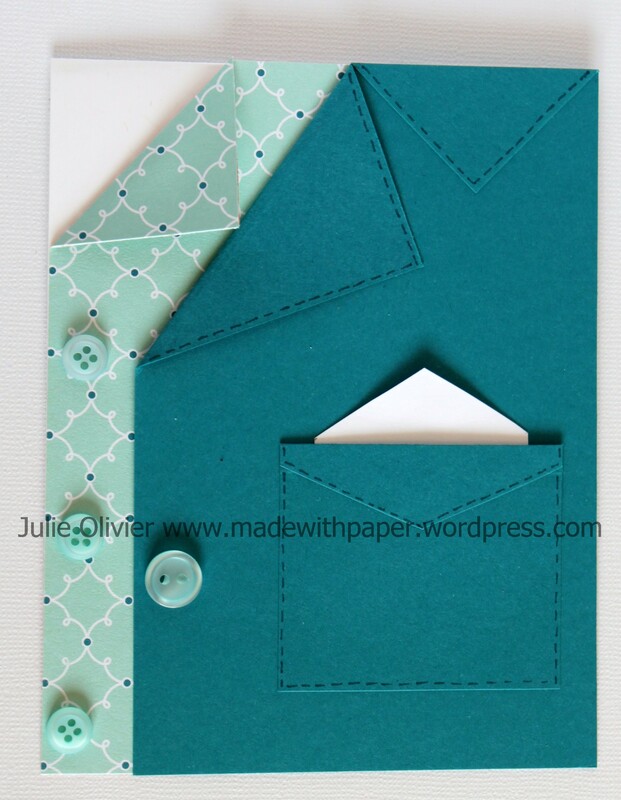 Add a pocket and some seam lines made with a Island Indigo marker. What’s fun is that you can hide a little message in the pocket! Fun Flowers Bigz L die Perfect for Mother’s Day crafts! 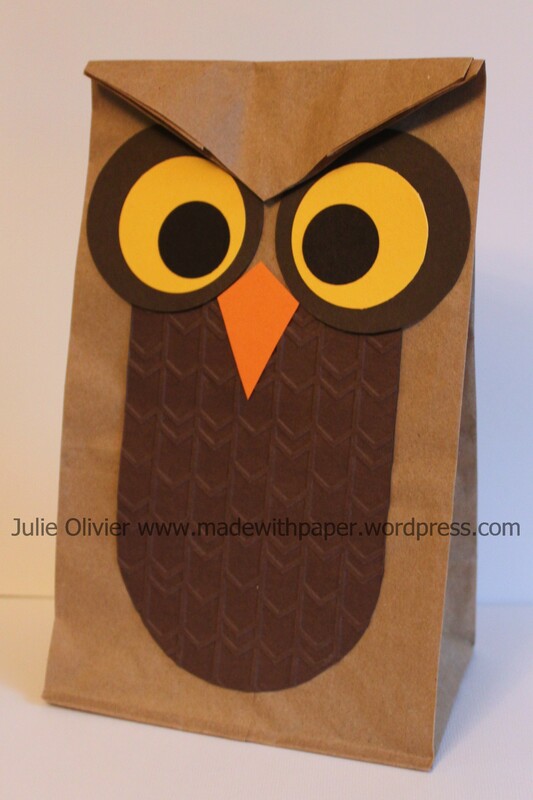 Mother’s Day being in less than 3 days, here’s a last minute craft to make with your children! I used the “Fun Flowers Bigz L die for all of these crafts. It’s a very good one to have, especially if you want to make easy children’s crafts! The flowers Bigz L die will be retiring soon… If you want to make the following crafts, make sure to buy the die before May 31, 2014! Here’s the Fun Flowers Bigz L die: #121812 Click here to order it today! To make the flowers, I simply cut colored card stock with the Fun Flowers Bigz L die and stack the different flowers with dimensionals in between layers to add some dimension. I used a straw to make the stem. The “Fringe flower” was made with our new Fringe scissors! So easy to use! Start with a strip of about 1-1/2″ to 2″ and about 22″ long (so glue two strips of 11″ together). 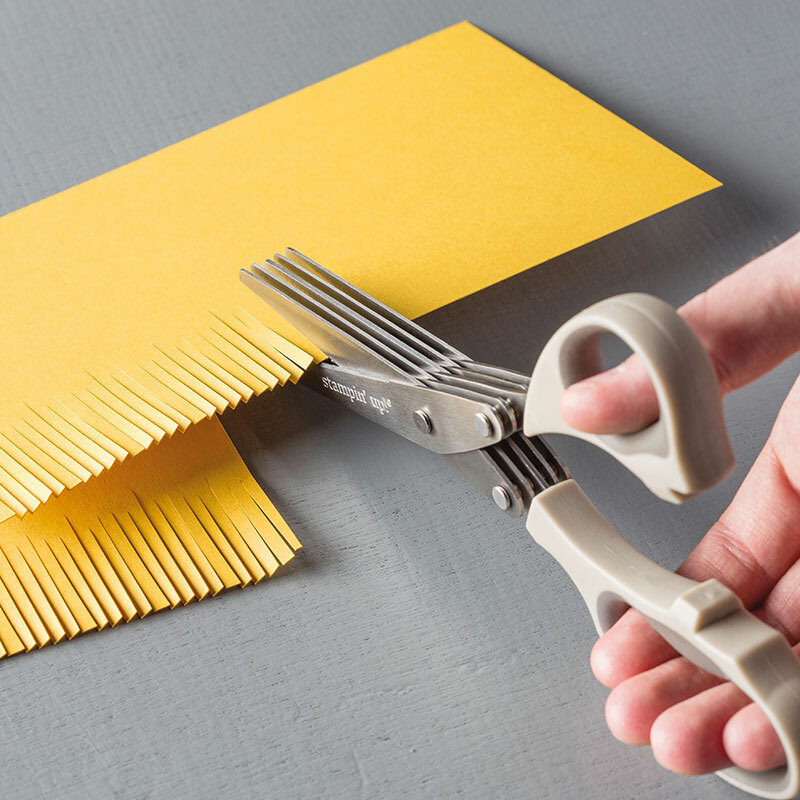 Cut along the bottom edge with the Fringe scissors. Be careful to leave about 1/4″ at the top so your fringes are all still attached together! Then, attach a straw at one end with scotch tape and start rolling! I found it helps if you put a little bit of Multipurpose liquid glue along the bottom edge. Secure the end with Multipurpose liquid glue. Let dry a minute or two. 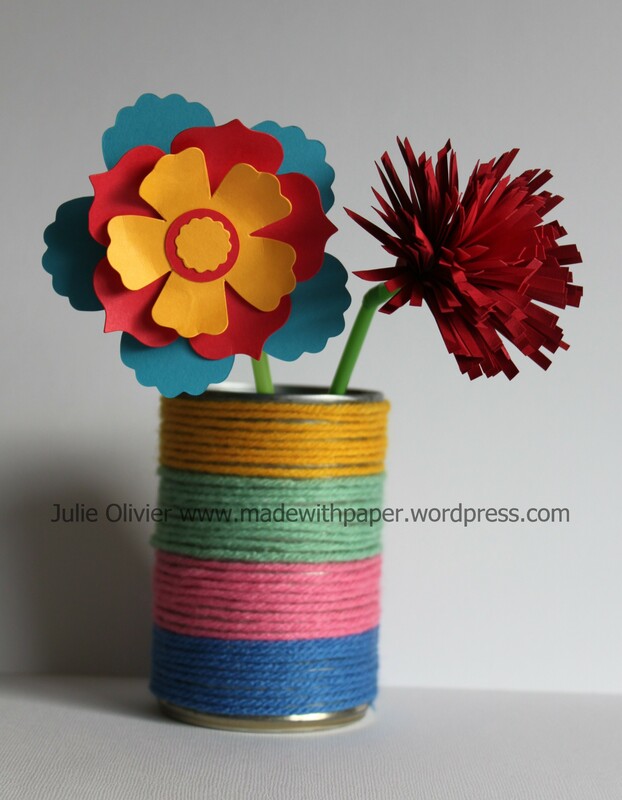 Then push on the fringes to make your flower “fluffy”! 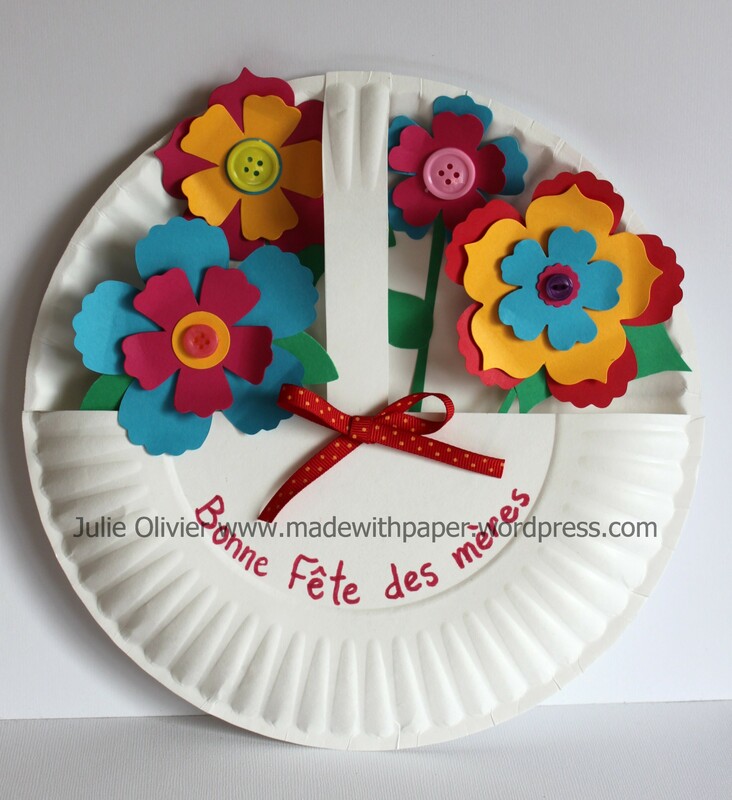 I also did this perfect craft for children with 2 paper plates and the Fun Flowers Bigz L die to cut the flowers. Add some buttons and a little bow and you have a nice flower basket for your Mom! The last craft is a magnet. 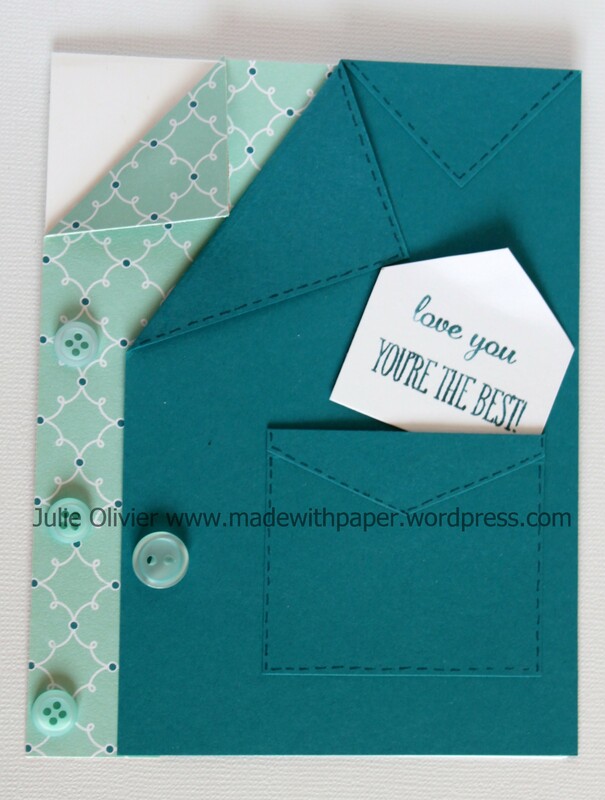 What I love about those Bigz dies, is that you can cut fun foam and felt with you Big Shot! So it’s very simple to put together! 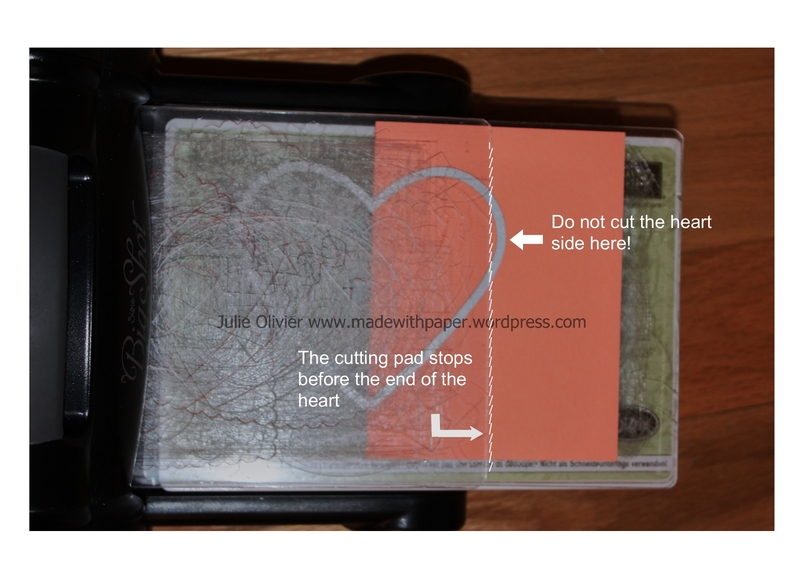 Use double sided tape to adhere your magnet at the back. Some magnets come in a roll with a self adhesive back, so that could also be a good thing to use. 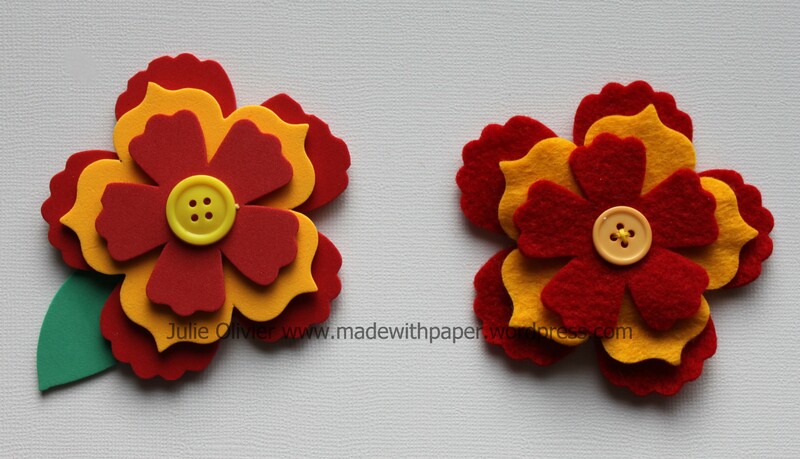 The flower on the left is made with Fun foam and the one on the right is made with felt. Happy crafting! Easter is coming soon! I can’t believe it’s already next week!!! 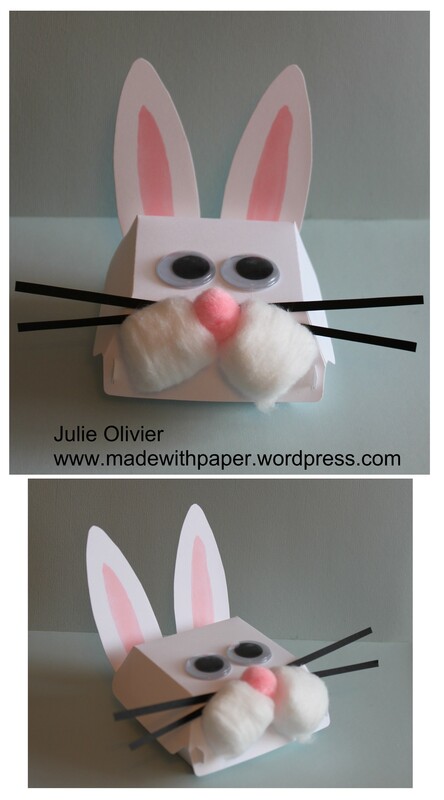 I have a nice and easy card for you to make with your children for Easter. Perfect to give either to the Grand-parents or the teacher! The background is Pear Pizzazz card stock embossed with the “Vine Street” embossing folder (which is still available on the Clearance Rack for only $2.99! Only while supplies last). The bunny is made with the 1-3/4″ Circle punch, the 1-1/4″ Circle punch and the Blossom Petal Punch (also from the Clearance rack!) 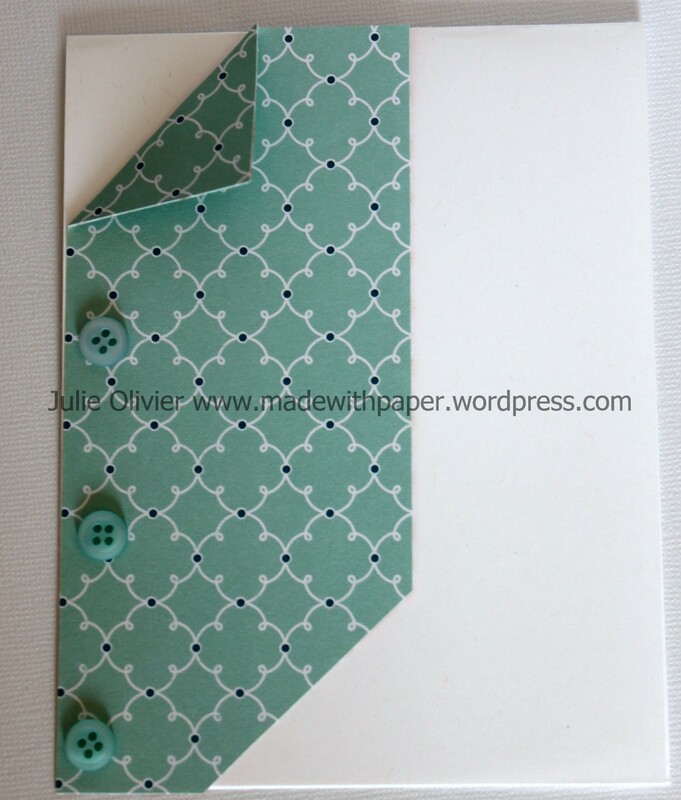 I used some buttons shaped like flowers to complete the card. If you can’t find flower buttons, you could cut some flowers with the Boho Blossom punch instead. 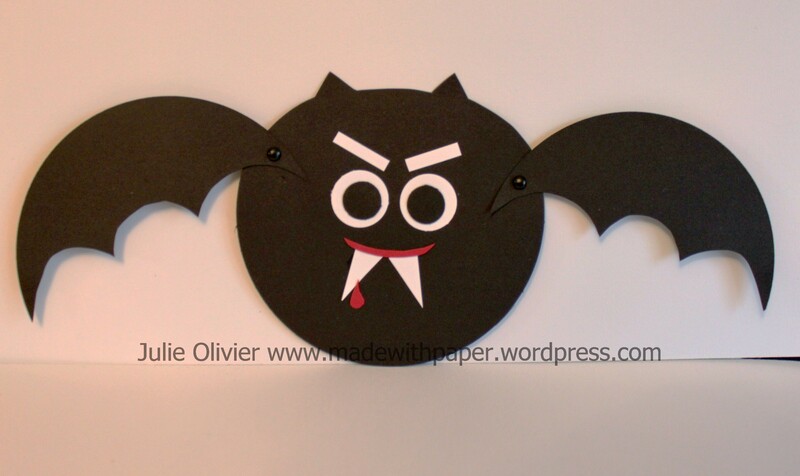 This is a perfect craft for children. 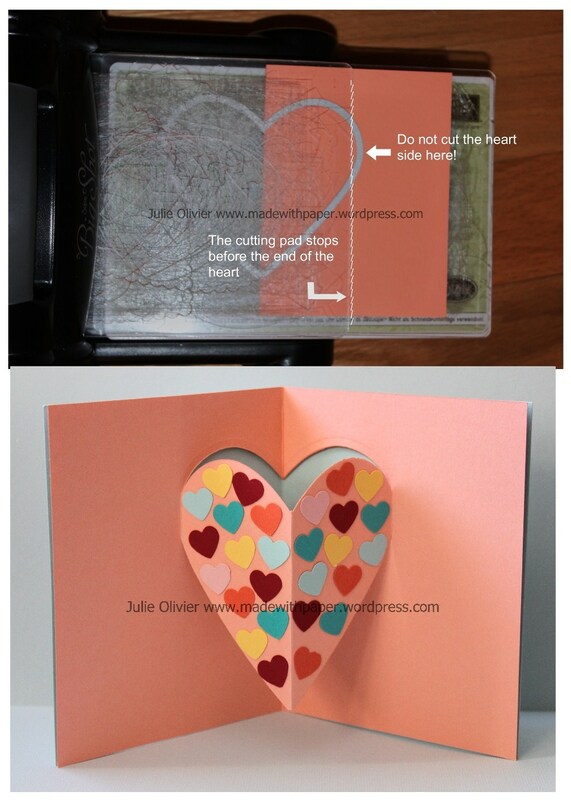 It’s a fun pop-up card that you can easily do with the Big Shot and Framelits or simply cut with scissors. I used the Heart Framelits Collection to cut the big Real Red heart for the ladybug body. A 1-1/4″ Basic Black Circle forms the head. 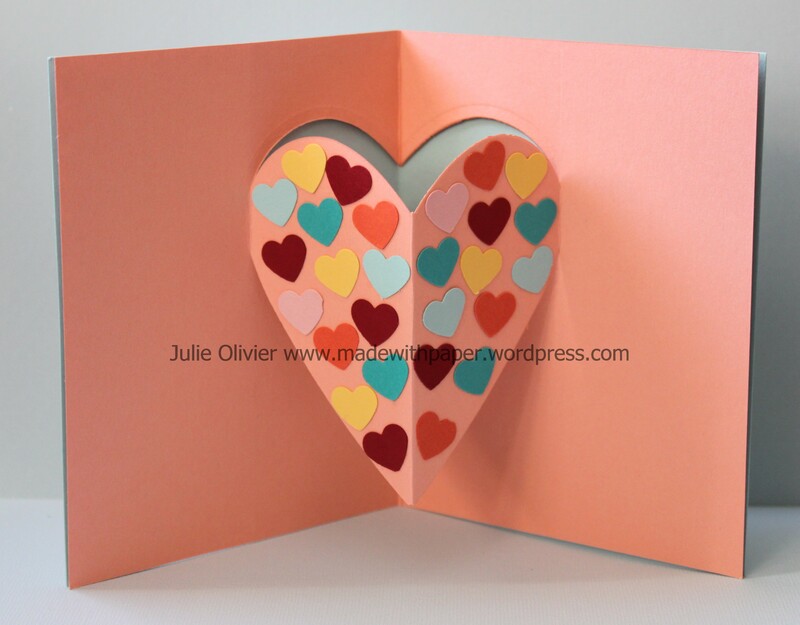 The small hearts are made with the Owl builder punch. 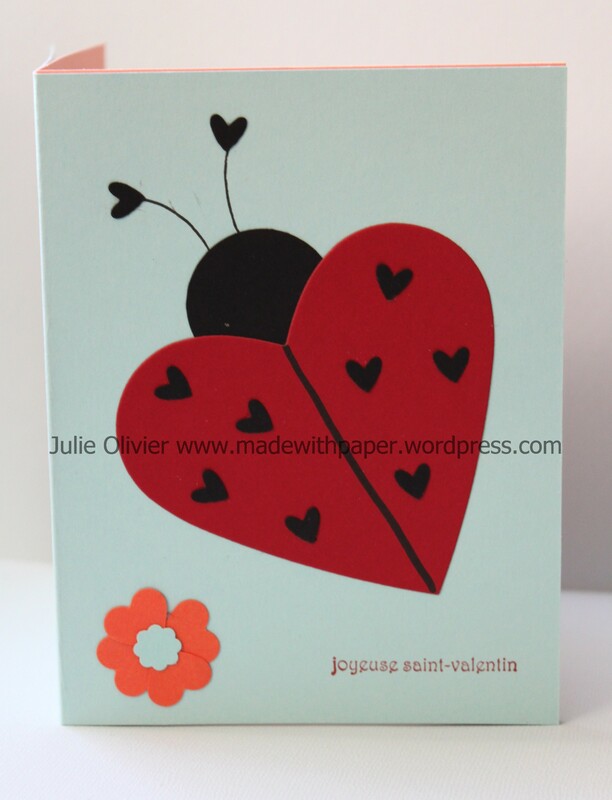 The flower is made with 4 small hearts and the flower from the Itty Bitty punch pack. The greeting is from “Voeux Mignons” (Teeny Tiny Wishes).